This video features the immediate surroundings of the Pepeshapissinikan site in winter. 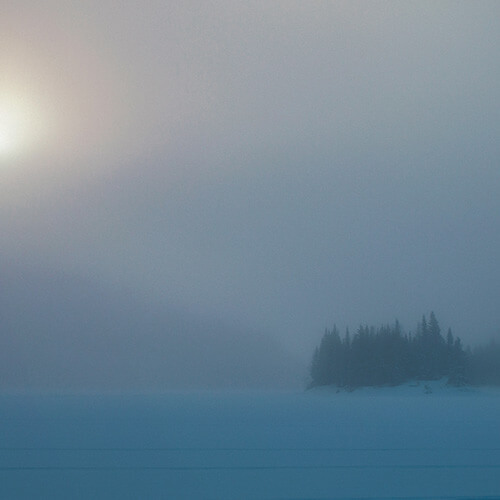 It starts with an overview of the snow-covered lake shrouded by fog. 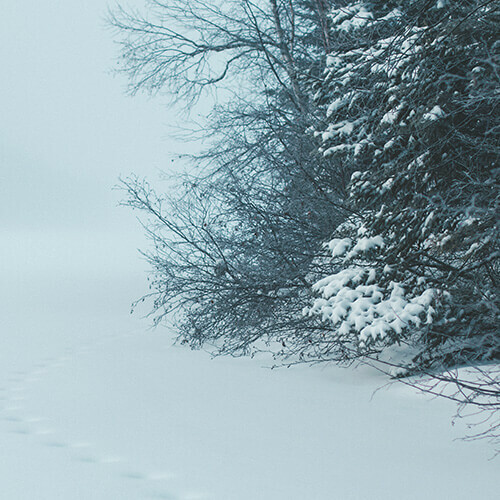 Then, the forest emerges as snow is falling over the trees. Next come close-ups in the forest, closing in on vegetation and rocks. A few images painted in red ochre gradually come into view. Then, the camera sweeps quickly above the forest cover. Soon after the cliff featuring the Pepeshapissinikan pictographs appears. Pepeshapissinikan, also referred to as Nisula, is an open-air site of rock paintings that date back more than 2000 years. 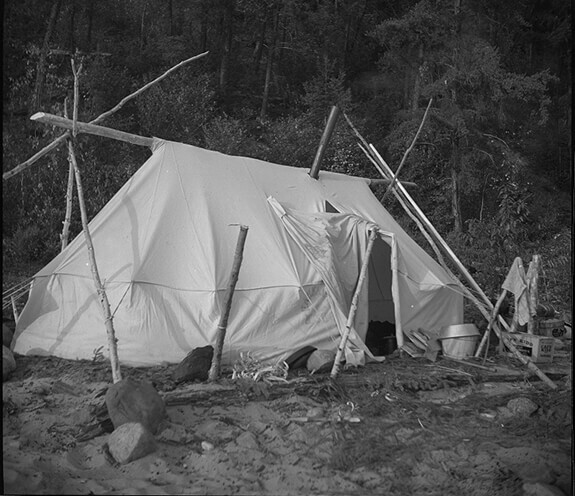 The site is an integral part of ancestral traditions specific to Algonquian-speaking Indigenous cultural groups scattered across the Canadian Shield. 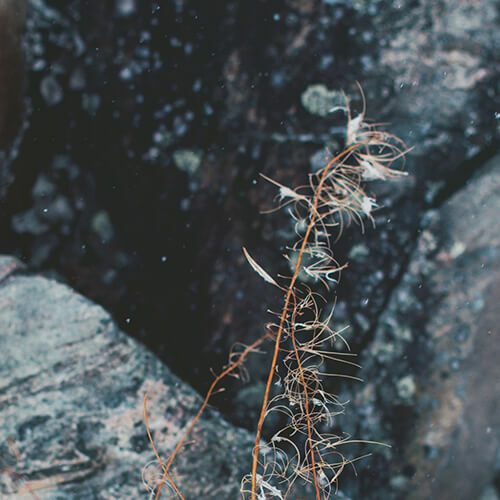 In plain sight on a cliff along one of the lakes in the Upper North Shore region of the St. Lawrence River, Pepeshapissinikan is an important heritage site for the local Innu people. The Pepeshapissinikan site is located on a high cliff wall alongside a remote lake. 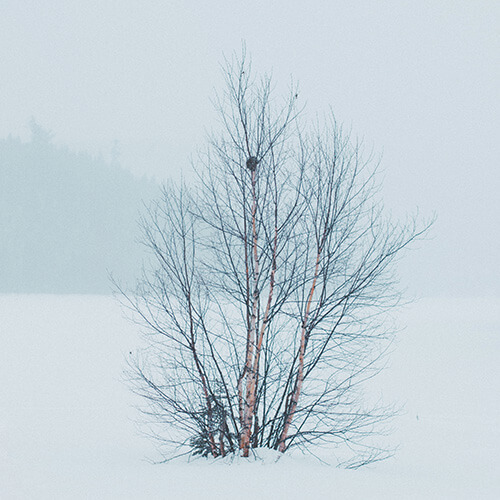 Teeming with fish such as trout and pike, this lake is mainly surrounded by coniferous trees (balsam fir, spruce, juniper and Eastern white cedar), with a few species of deciduous trees like white birch. Sphagnum moss and lichen cover the surrounding ground. In the summer, small fruits such as blueberries abound. 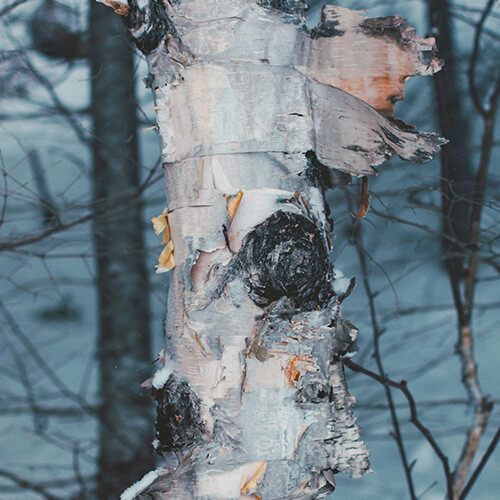 The boreal forest is home to many animal species, including the black bear, moose, beaver, fox, wolf, porcupine and hare. 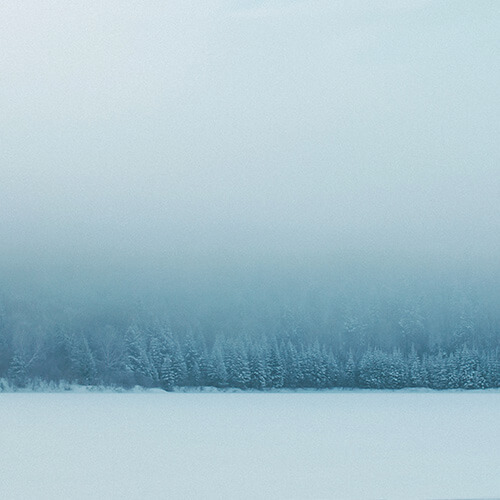 The climate is temperate with an average of 15°C. 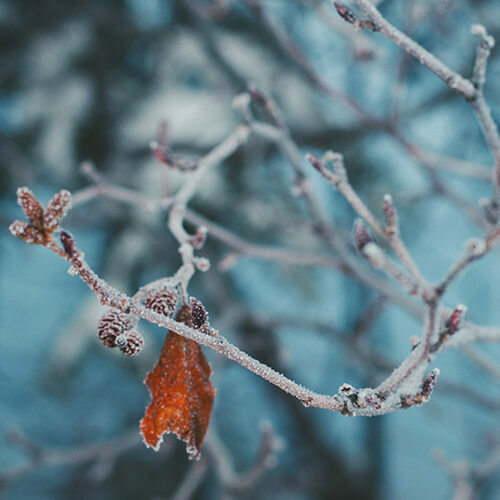 But from summer to winter, temperatures vary greatly by more or less 50°C. 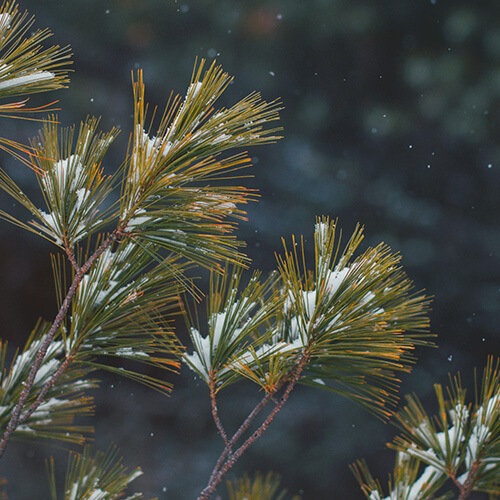 Precipitation can reach up to 1000 mm/year. 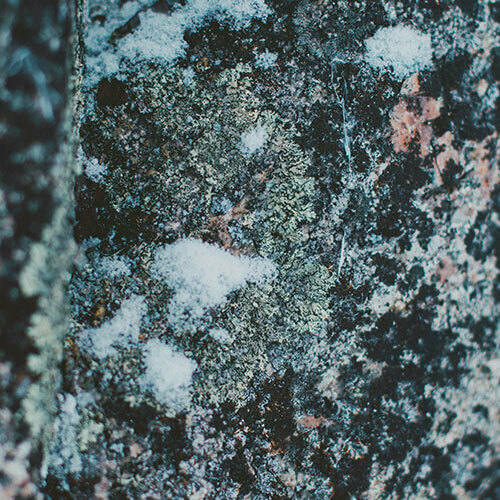 Pepeshapissinikan is an Innu word that means “the rock formation with paintings.” Its origin is an age-old word: Pepéchapissinagan. It was recorded as early as 1731 on the maps of Father Laure, a Jesuit missionary. 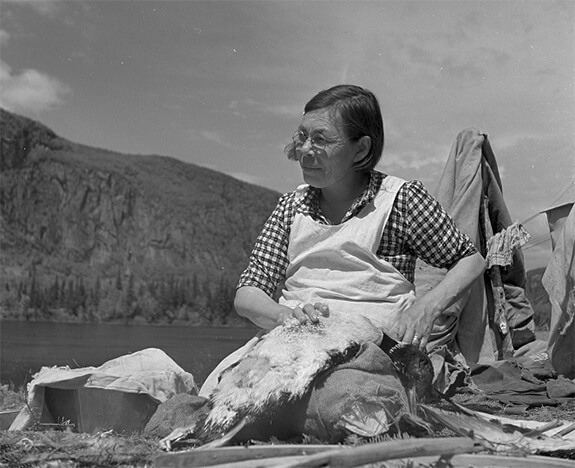 The Innu obtained most of their traditional staple foods from hunting, fishing and gathering. They were constantly on the move, seeking resources where available within their territory. This nation was divided into several bands often associated with drainage basins. 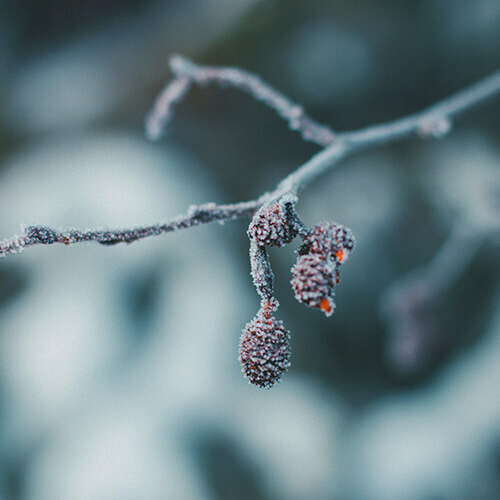 During the summer, the Innu gathered on the coastline or the banks of the main lakes and waterways to harvest Nature's bounties. These seasonal gatherings also provided opportunities to forge marital bonds. 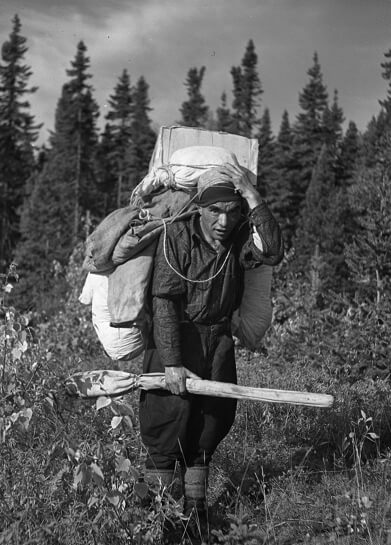 In the fall, the Innu left and moved inland. 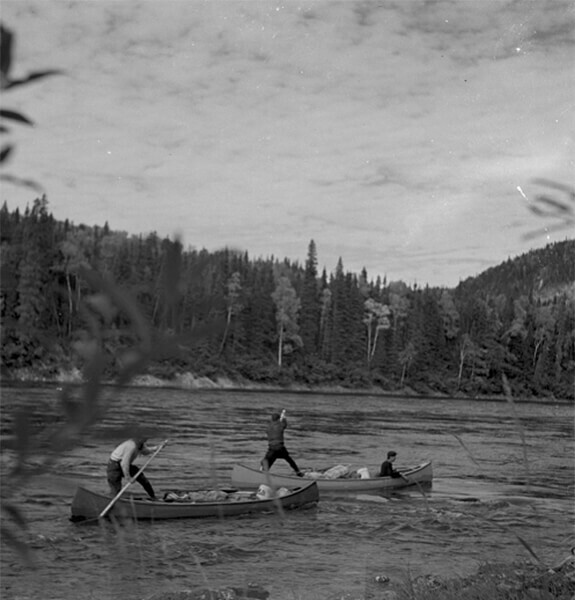 Hunting large game, such as caribou, was their main subsistence activity. 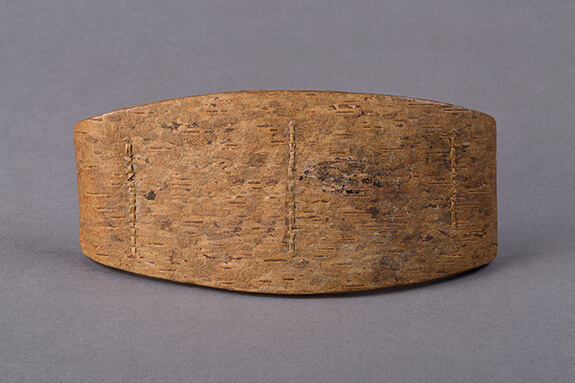 Innu’s beliefs and rituals shaped every aspect of their day-to-day lives. 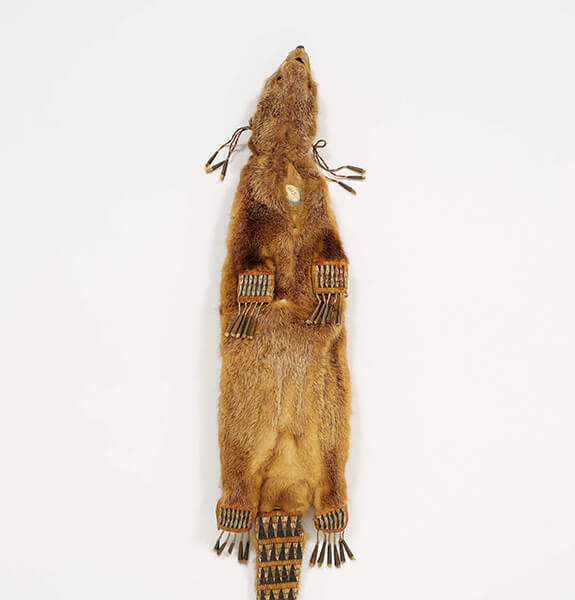 Hunting conveyed the intimate relationship between humans and the animal world. Each animal species was under the protection and control of a higher power, a “Master of Animals.” Invisible powers visited hunters mostly in their dreams. 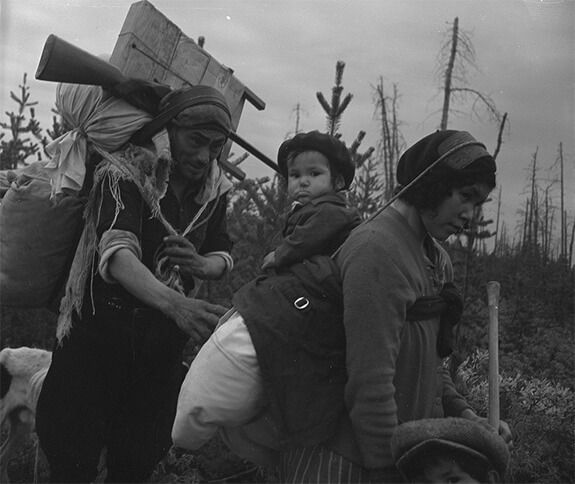 In times of need, the Innu also called upon some powerful beings living on the land, such as the Memekueshu at Pepeshapissinikan. 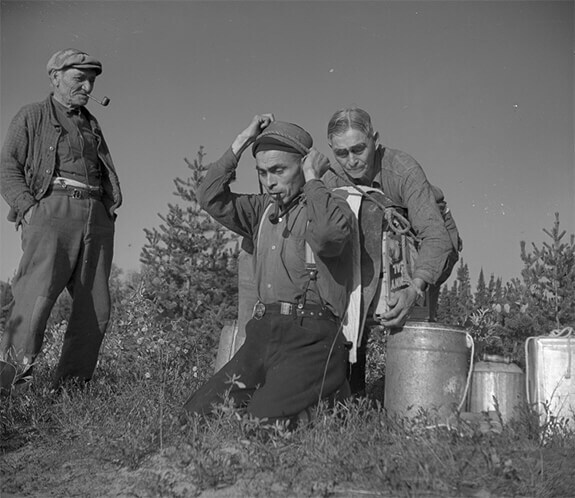 This is a video recording of a purification ceremony featuring Grégoire Canape, Marcelline Blacksmith and Marcel Dominique, three members of the Pessamit Innu community located in the Upper North Shore region of Quebec. 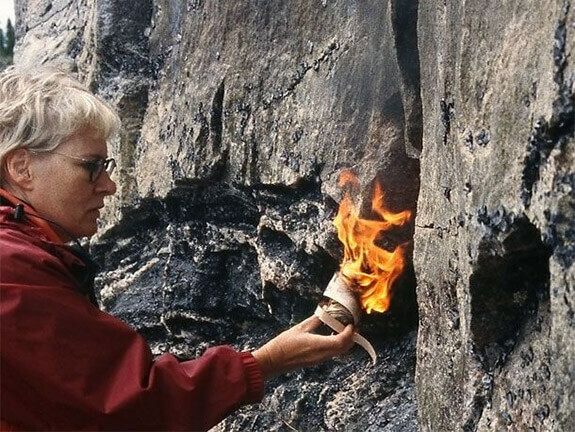 The scene starts with a fire burning next to a cliff. 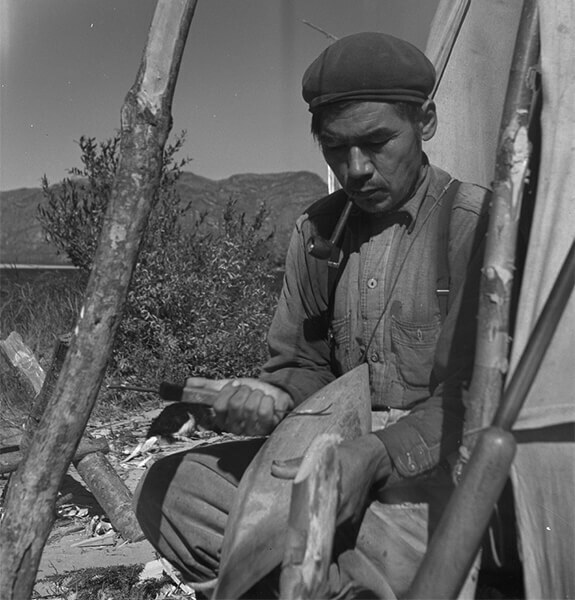 The leader performs a ceremony by lighting a sacred pipe that he then passes on to the other Innu. The ceremony takes place to the rhythm of a drum and a traditional song. The wife of the leader of ceremony dances at his side. The ritual ends with food and tobacco offered in a sacred fire to the spirits of the place. 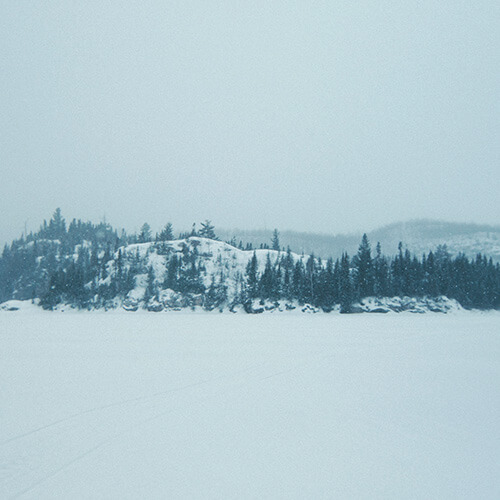 The Innu venerate this sacred site. They practise incantation and purification rites at the site with drums and offerings (e.g., tobacco) to maintain a privileged connection with their ancestors and the spirits of the place. The site was discovered accidentally in 1985 by Anne Nisula during a fishing expedition. She noted several paintings on the face of a tall rock formation that were oddly similar to those found in her native Finland. 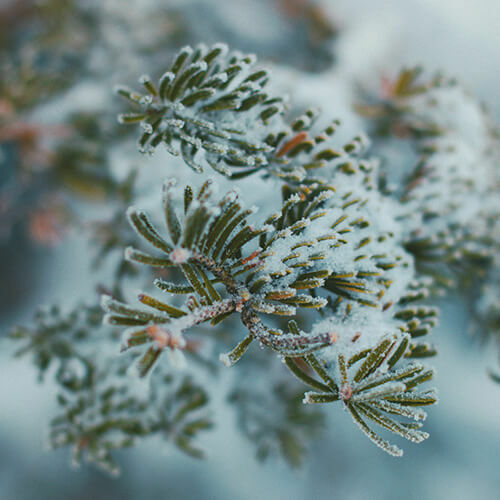 Father Pierre-Michel Laure was the first to indicate the site’s Innu name on the maps of the Domaine du roy that he drafted in the northeastern part of New France, between 1731 and 1733. 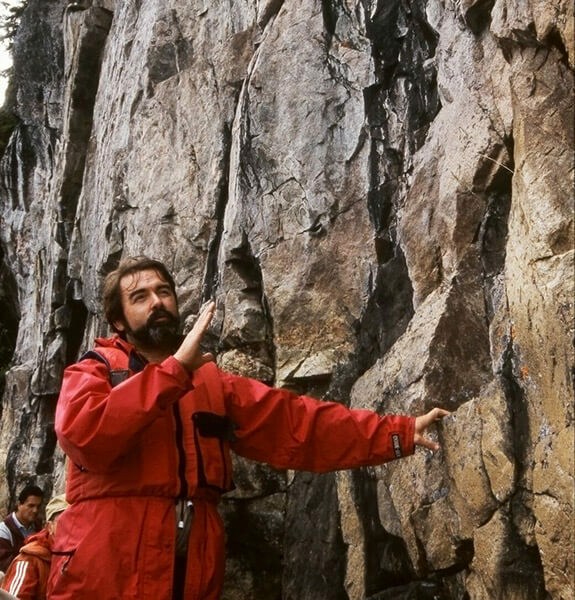 Father Laure also added the French translation of the place name “We can see naturally painted figures in the rock” on the maps. Like many other sites across the Canadian Shield, Pepeshapissinikan is an open-air rock art site on the exposed face of a cliff beside a body of water. 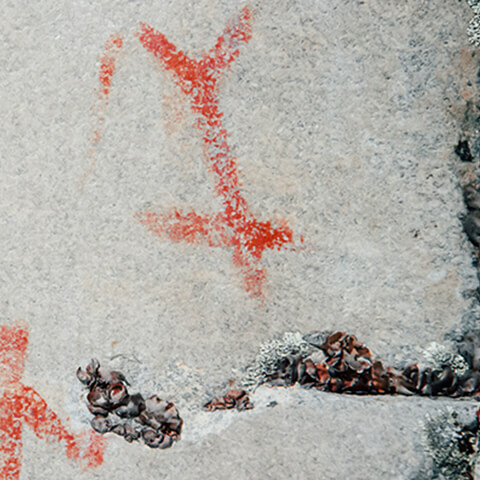 A monochromatic scene painted in red covers more than 14 m2 of the rock surface. Divided into four panels and created in several stages, the artwork illustrates various figures surrounded by several more or less complex linear motifs. The marbled texture and crevices of the rock clearly contribute to the overall imagery of the scene. The motifs and their meanings still elude us. The cliff is formed of granodiorite (magmatic rock similar to granite), with ingrained feldspar and quartz. On the left of the central panels (II and III) and some 3.6 metres above the lake’s surface, panel I features only two parallel vertical lines less than 6 cm long each and an indefinite streak 4 cm long located 33 cm to the right. About 2 metres above the lake’s surface and covering an area of some 4 m2, this panel has the most paintings at the site. It illustrates several more or less complex geometric motifs and a few anthropomorphic and zoomorphic figures that are 10 cm and 22 cm long. Located 2.5 metres above water level, this panel features intriguing motifs: one figure with arms raised and other figures that suggest Roman numerals (III and IV). Ages ago, part of this panel broke loose and fell to the bottom of the lake. On the right of Panel III, this section features two parallel vertical lines 14 cm long each. Like the lines on Panel I, these two lines might have served to mark off the lateral boundaries of the site. Former location of the rock fragment that separated from the cliff. The 1.25-ton chunk now lies under 12 metres of water. 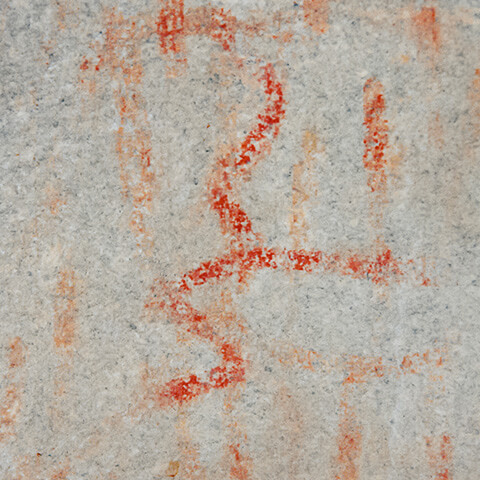 This singular figure painted at the very centre of the rock art scene is likely a Memekueshu. Depicted with a long, asexual body with large feet and a triangular head, it appears to be walking towards a crevice to enter the rock where it dwells. 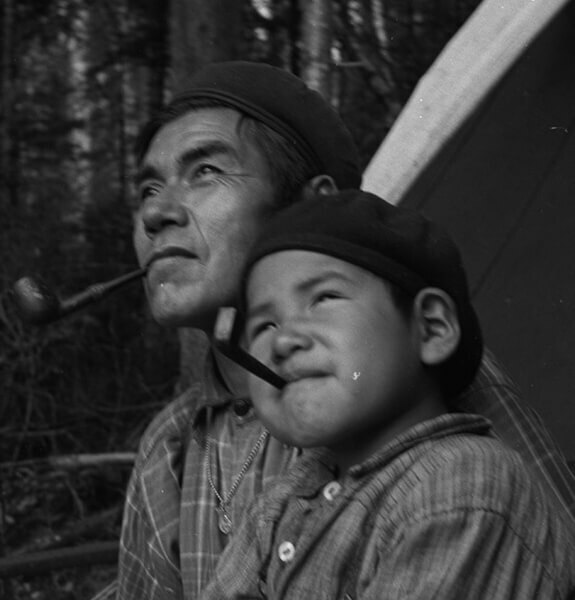 According to Innu oral tradition, Memekueshu has a slender head to easily penetrate crevices in the rock. 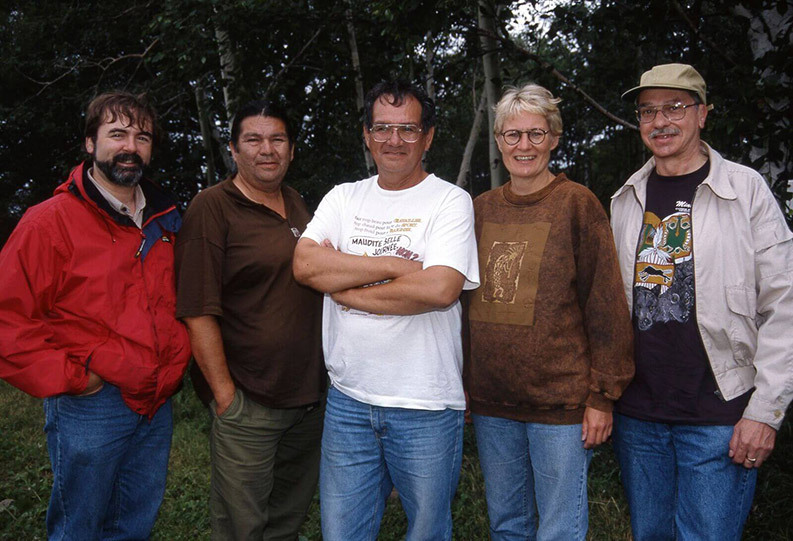 According to Algonquian beliefs, Memekueshu sometimes mingles with humans to transmit medicinal knowledge to them. However, this creature also likes to play tricks on humans before fleeing in a stone canoe! Memekueshuat are often described as small hairy beings. 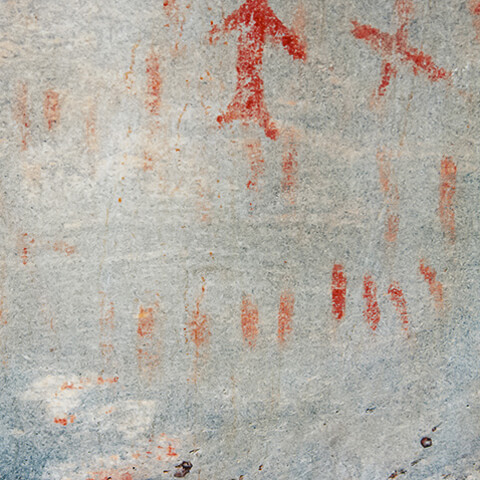 Elders also say that some rock art was painted by Memekueshuat with their own blood. In this scene, an inverted anthropomorphic figure (head down) was depicted above the Memekueshu. This representation may be interpreted as a deceased person, a person diving in the water after an overly prolonged vision quest, a spirit entering the rock through a crevice or a medicine man (a healer, diviner and interceder between humans and spirits) penetrating the rock to receive Memekueshuat’s medicines and teachings. An inverted figure may also represent the act of flying. The spiritual dimension of these images is highlighted by two figures with horns. In Algonquian beliefs, horns represent spiritual power. A figure with horns may be identified as a “Manitou,” a great spirit. Algonquian peoples called upon these powerful entities for help. This figure may also be a medicine man. The figure with horns appears to hold in its left hand a cross-shaped object. 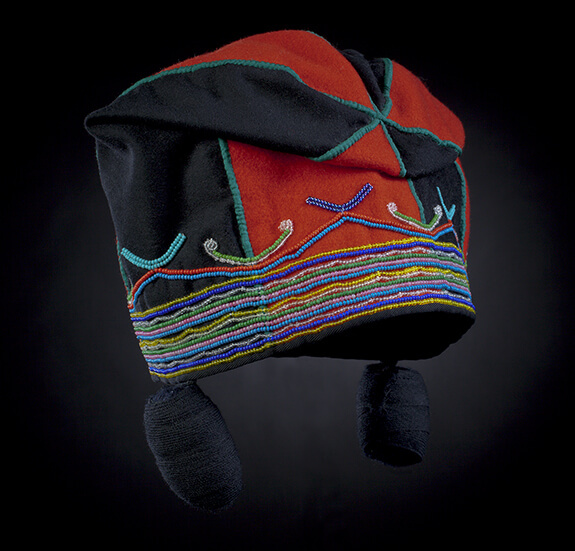 Based on Algonquian imagery, it may represent a rattle, a drumstick or a medicine rite object. Figures with horns are featured on many rock art sites across the Canadian Shield, from Quebec to Saskatchewan. This figure is carrying an oblong object in its left hand. It may represent a medicine man holding a medicine bag. 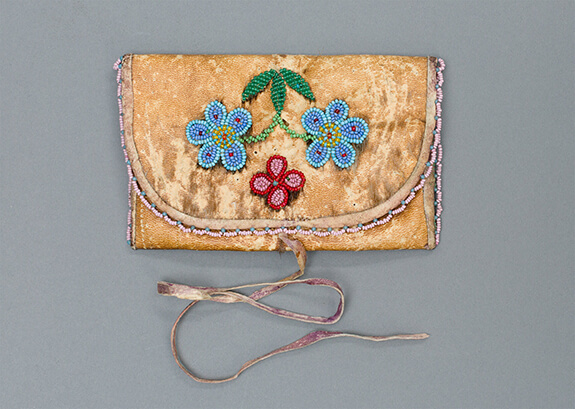 Medicine bags were made with otter, marten, muskrat or bird skin. They held plants, minerals, stones and animal parts like bones that were used to perform healing rites or ensure successful hunts. 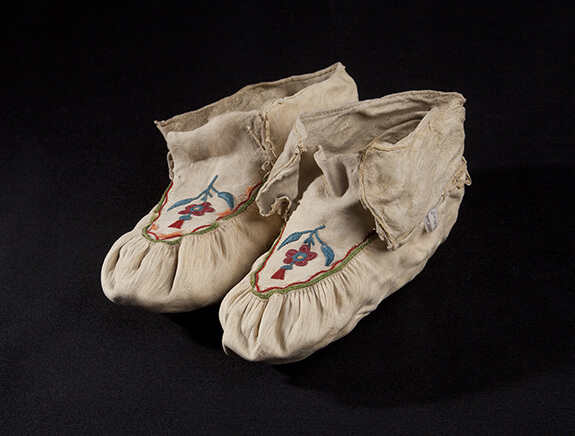 Medicine men may have received some of the objects from Manitous. On the bottom right of Panel 2 is a series of parallel vertical lines. Sometimes painted oblique, they are frequently found in Quebec and Ontario rock art. They are believed to represent a tally system. 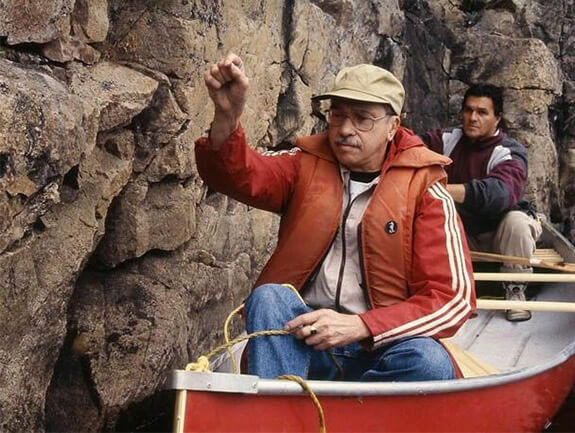 The vertical lines may also represent a canoe crew. However, such is not the case at Pepeshapissinikan because there are no images of watercrafts (usually represented by a slightly curved horizontal line under vertical streaks). An undulating motif shown on the lower left section of Panel 2 alludes to a snake. 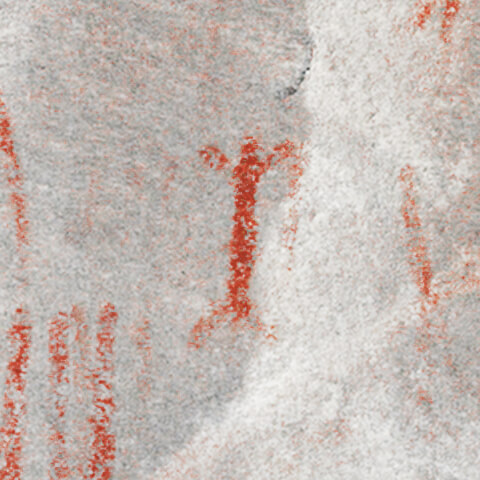 This motif appears at several rock art sites and is generally related with the Underworld. The most important being of this world is Mishipeshu, a powerful Manitou feared by all because of the waves and whirlpools that it causes on lakes. 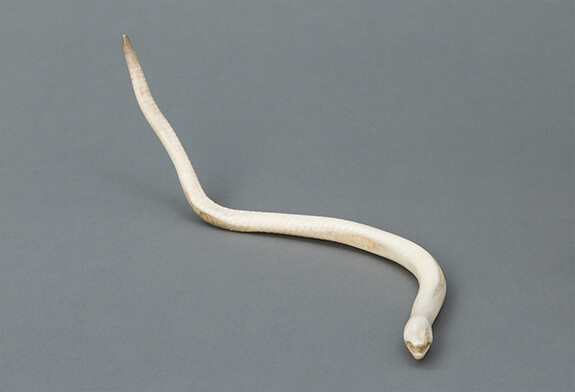 Mishipeshu and snakes are the enemies of Thunderbirds that rule the Upperworld. This is a video of an interview with Pessamit Innu talking about the discovery of the Pepeshapissinikan rock art site, its images and the importance of its legacy. The conversation is interspersed with images: an old map featuring the Innu name of the site and close-ups of certain figures depicted on the cliff. This heritage site is constantly exposed to changing climatic conditions. 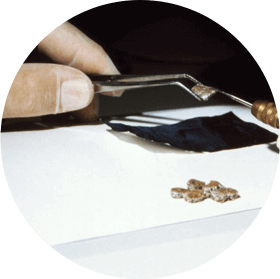 Preventative conservation studies are carried out on a regular basis to better preserve it. 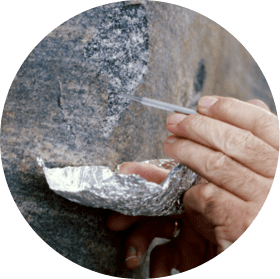 Through careful and systematic observation of the rock, minor cleaning work can be carried out on the painted surfaces to remove lichen growth. These measures have been implemented to protect the site from any natural or human disturbance. 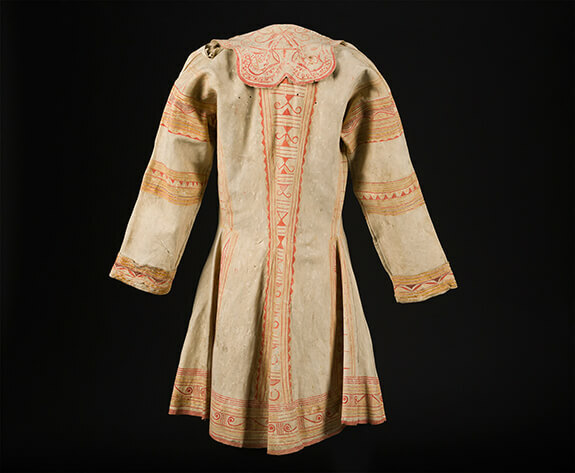 All the motifs were painted using hematite, a mineral substance rich in iron oxide that was crushed and mixed with water or any other binding substance (e.g., animal fat). The “artists” used their fingers, mainly their index, as the easiest tool to apply the paint. 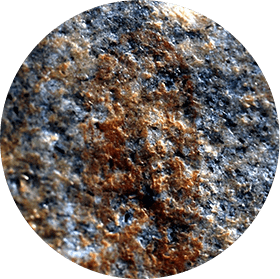 The scientific study of the site is based on the documentation of the material, visual and acoustic features of the site, as well as on samples taken for laboratory analysis. The interpretation of the graphic content is based on a host of relevant archeological, anthropological, ethnohistorical and artistic data. Carbon-14 dating on two samples from Panel II helped to determine that Pepeshapissinikan could be between 2000 and 2200 years old. Long ago, a chunk of rock broke loose from the lower part of Panel III and sank with its paintings to the bottom of the lake. The 1.25-ton chunk now lies under 12 metres of water. 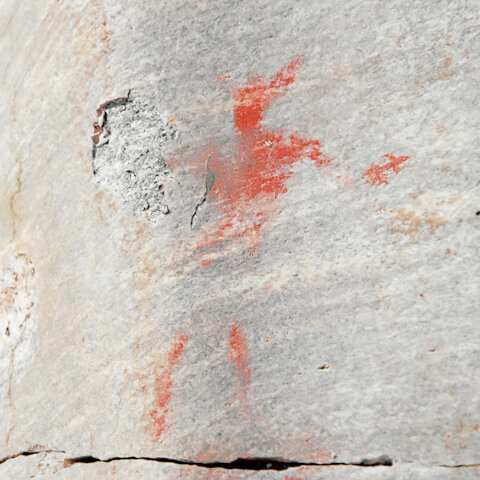 In 1992, divers were unable to see any pictographs, because the rock rests on its painted surface. This slab of rock conceals a page in the history of the site that remains unknown. 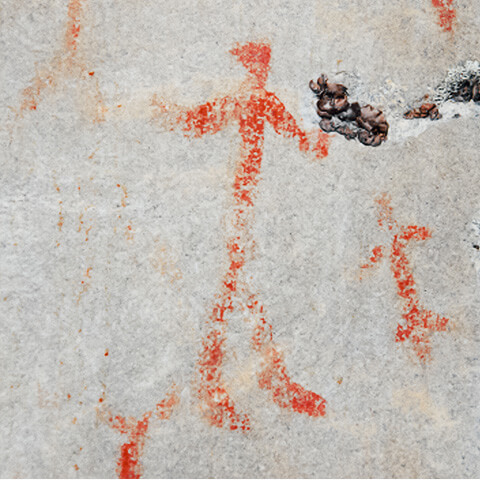 It may hide images never before seen that are likely to change our understanding of the Pepeshapissinikan site and even of rock art in Quebec. View of the cliff, looking up from its base to its top. Grégoire Canapé lights a sacred pipe. His wife, Marcelline Blacksmith is at his side. Then Marcel Dominique joins them for the ceremony. In the foreground, on the snowy ground, ritual objects are placed on a piece of cloth. Gregory raises the pipe to the sky. 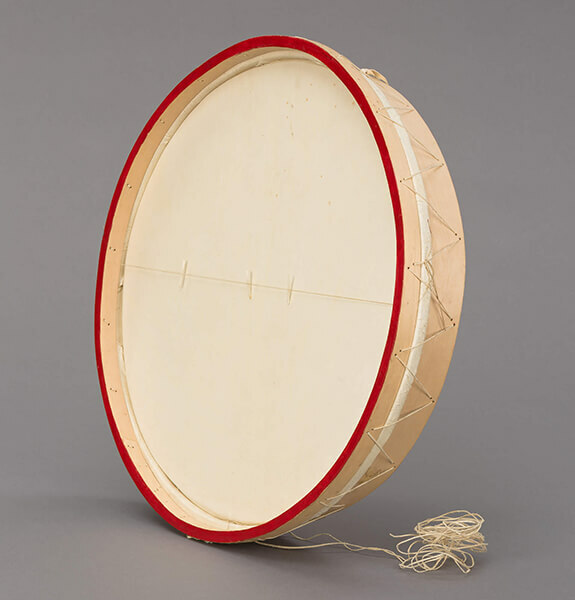 Grégoire sings to the rhythm of his drum. Marcelline and Marcel are at his side. Close-up of the three people. Marcelline dances and holds in her hands a small bark container. Close-up of Marcelline. Her head is leaning over the pipe and she strokes its stem with her hand. Close-up of Marcel who, in turn, smokes the sacred pipe. Pipe in hand, Grégoire utters words while gazing towards the sky. The three participants throw tobacco and other offerings in the fire. Hi everyone. [The man on the left introduces himself] I’m Robert Uapenuss Dominique. I’ve been living here in Pessamit for a very long time. I would like you to introduce yourself too and tell us where you come from. [The man in the center introduces himself] I’m called Pepameshkenueiken. The bear is my totem; I am a member of the Medewin. That is how I pray. Hello to my relatives, my brother Robert, my nephew Grégoire. [The man on the right introduces himself] My name is Marcel Uapenuss Dominique, like my brother. 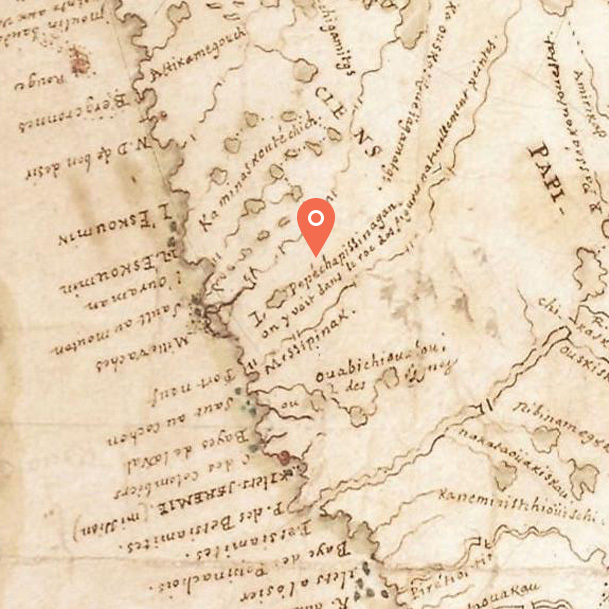 [Robert Dominique speaks] I felt great pride and about this missionary, Father Laure, in the 1700s… Here is his map, that’s the right one, right? In the 1700s, he was already calling it Pepeshapissinikan. [Still frame of the "Pepeshapissinagan" place name] This document is very old. When we look carefully at these paintings, we see human forms. [Static shot of the three men. Grégoire speaks] There are several things that we could talk about. Who do we see in the paintings? [Still image of a human-shaped figure with a triangular head and open arms] There was even talk about the Memekueshuat. [Robert Dominique] And how about you Marcel, what do you understand from it? [Shot of the three men. Marcel Dominique speaks] These paintings would have been made by our ancestors, as Grégoire pointed out. The first time that I went there, I didn’t know what I was looking for, what I would do there. There must have been something (…) powerful, I would say, or our ancestors were present. [Grégoire Canapé] Later, we went to the site regularly. I went there once with my wife, after I invited her to come and see this place deserving full respect. She takes great pride in it too. And she too felt something. We prayed. Then my wife spoke; she addressed the mountain, telling it: “We will defend you, nothing will be done on this site if not properly done, so as not to disturb you, so nobody hurts you.” [Aerial images of Pepeshapissinikan in winter, the lake at the foot of the cliff is frozen and covered with snow] It’s as if one would have laid their hands on the shoulders of a scared child. 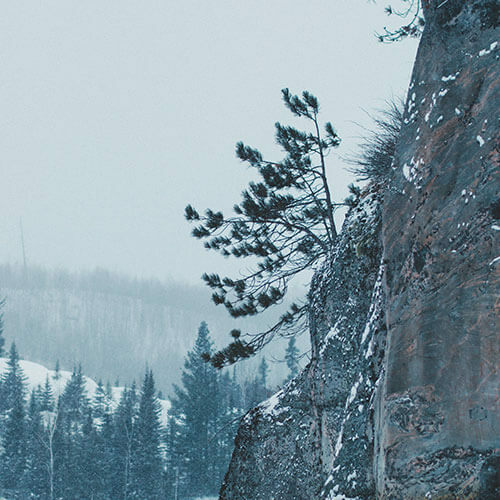 [Static shot of Grégoire, his wife Marcelline and Marcel, all standing in winter clothes at the foot of the Pepeshapissinikan cliff] Every time that we go to the site, we perform rituals. Because those people were our ancestors. [Static shot of the three men in the tent] The White people want to defend this site. They look at the configuration of the rock art site and say that it would be good to protect this site, so that it doesn’t fall into ruin, so that it doesn’t deteriorate. And you, they tell me, what do you think? This Pepeshapissinikan, I tell them, I don’t know how many thousands of years it has survived. Why should we place something over it to protect it? The only way to protect it is to respect it. We should not install anything over it. Because they wanted to apply some sort of paint over it, so that the images would not deteriorate. That is what they wanted. But I told them no. I do not want them to do that. Because this is really very sacred. I told them in French: “It is sacred.” That is what I told them so they would understand.